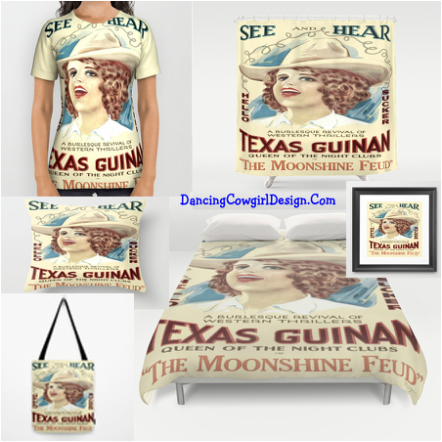 Dancing Cowgirl Design products available at Society 6. Western, Rodeo, Vintage Cowboy and Vintage Cowgirl designs on home decor, bedding, bags and clothing. I have another great place to share my designs. These are available in my store at Society 6. Society 6 is print on demand company that host some of my designs which can be printed onto a variety of merchandise. As you see in the picture above, one design resized and aligned can look good on lots of things. Society 6 handles all of the manufacturing and shipping . This is a current list of items available through Society 6. I am always busy trying new create new ideas or find cool vintage works that are now in the public domain for use. I just love western stuff, but I do create other things as well. These are some of the collections that I have out now. You can see more at Society 6.